Let's start off with the basics how much do I weigh? The answer is a lot. Put it this way, you'll never offer me a piggyback. Maybe at some point I'll say my starting weight but for now I'll tell you that I have to analyse chairs before I sit on them. I'm also going to spare you any before photos of me in a tight top looking like I've been vacuum packed, nobody needs to see that. I am going to posting every Sunday for as long as I feel it necessary for. I don't want to even go there with the "but if it doesn't work out I'll magically stop talking about it" because that sounds like I have doubts but equally, I am only human and I don't want to be vowing to do this forever to the point that the pressure is too much, anything with too much pressure is bound to fail anyway. Without getting grim, I'll outline my life in terms of weight. For as long as I can remember I've always thought I was fat and I can never pinpoint it as looking at childhood photos, I wasn't. I do remember one of my brothers calling me fat when I was probably around eight and my parents going nuts at him but that's it. The weight crept up gradually as the years went by until in 2007 I fell in my house and tore the cartilage in my knee. My knees haven't been right for ages as I was born with twisted hips so walking requires that extra bit of concentration. Due to my hips not being right I wasn't too surprised when it happened but as I literally wasn't able to do more than a shuffle for seven weeks, I piled on just short of two stone. That's a scary thought actually and you might have assumed that's because all I did was eat but the irony was I wasn't even able to get into the kitchen! Fast forward to 2011, my husband and I joined Slimming World and although he didn't have as much to lose, it was great to have him supporting me and that we were eating the same things at home. Three months later we had lost three stone each, it thrills me just to think about that! I have to say, for the first two months it was easy (Eeek is that too cocky?!) but we were both losing 3 or 4lbs each week. 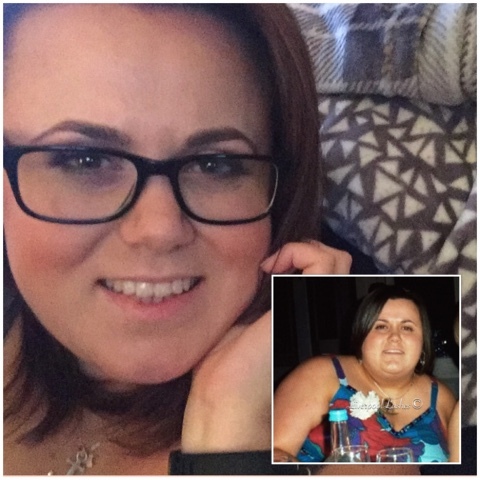 The final month however was a huge struggle which I honestly can compare it to riding a bucking bronco because I knew that it was making me happy to lose the weight and I was seeing a massive difference in my clothes but I could literally feel myself losing the grip that I had on the situation. You know when you see the people on those mechanical bulls that are virtually sideways but are just about still holding onto the horns? Yeah that was me as I got to that finally couple of pounds to get my three stone award, virtually a week or so after that I gave up Slimming World. It's almost hilariously stupid when you think of it, here you are wanting something so badly and as you get closer to reaching that goal, you give up. Anyway I don't wanna dwell on the part of things because its pointless, the past is in the past and all I try to do is remind myself that that is possible in 12 weeks again if I wanted it to be. 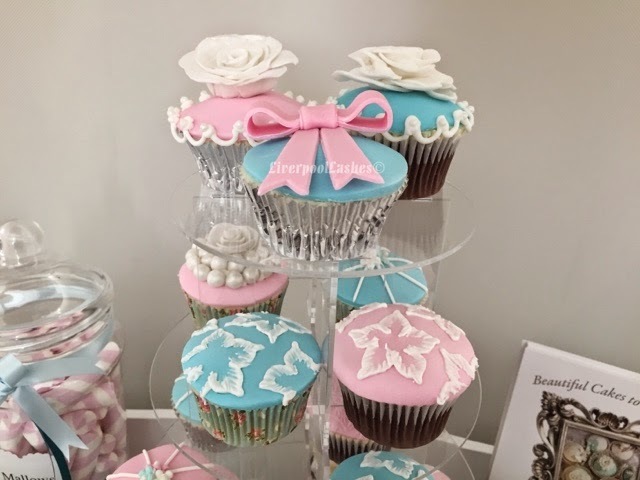 So I suppose you want to know what I plan on doing to lose this weight? I am going to be following Slimming World, I know it like the back of my hand and I also know that it works. Of course I am going to use my common sense with it, let's face it we all know what we should and shouldn't be eating but it's more about steering clear of things like a half price offer of Ben & Jerry's at your local Co-op or when Asda goes mad and put all kinds of packets of biscuits to 50p. Alongside that I need to get this body moving so I'm also using my treadmill and taking opportunities to be more active. I actually fired up the very dusty and unloved treadmill today and happily started my routine. The next thing I know I then nearly fell off because it must have been my husband, many years ago, that used it last and it was on some sort of crazy setting. After two minutes it automatically doubled the speed! I've definitely aged in the panic of trying to get it to slow down whilst keeping up with it. I also ate some pineapple for lunch and it made me tongue feel all fizzy which I've virtually put down to it wondering what the delicacy was that I was feeding on as it was fried....! Anyway, I have nothing else to say at this point other than I'm weighed, my new healthier food is ready and waited in the fridge. 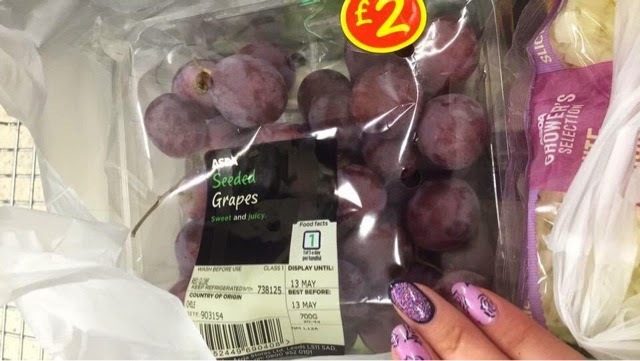 I bought some ridiculous sized grapes amongst other things that I just had to show you, compared to the size of my nails...!! They're basically small apples! I plan to try and keep myself busy, when you're sat around, especially if you work at home like me, it's easy to graze throughout the day. I feel like slim people have a different attitude to food, it's just something they do at certain times of the day and that's where I want to be too and not constantly thinking of it. So here goes, I'm excited! All encouragement is welcome! Come along for the ride too. Each loss is a step closer to where I want to be and its not unobtainable. Please make sure you're following my Facebook page for updates and if you have any suggestions, ideas or whatever then you can always contact me there too! I shall see you next Sunday for my next instalment and hopefully to report a loss of a couple of pounds!